Canada Invests $2.2M in Clean Technology Grants | Mentor Works Ltd.
Canada continues to transition and evolve to support a low-carbon future and reduce pollution. One of the industries making changes is the Canadian oil and gas sector. Recently, two Alberta businesses received federal government funding for projects to reduce methane emissions and help Canada achieve long term climate goals. Clearstone Engineering Ltd. and Patro Research Ltd. have been awarded a combined $2.2M in clean technology grants from the Energy Innovation Program. The Energy Innovation Program (EIP) provided funding support for businesses completing cleantech research, development, and demonstration projects. Although the program is now closed and has not announced a new release date, companies with similar projects may qualify for other research and development funding programs. Canada’s high methane emissions in the oil and gas industry presents an opportunity for energy companies to develop innovative processes and products to reduce these gases. Two businesses in Alberta have recently been awarded Canadian government funding from the Energy Innovation Program for projects tackling this challenge. Clearstone Engineering Ltd. is an international environmental engineering firm specializing in air emission assessments and industrial air pollution control. They serve the natural gas, petrochemical, energy, and petroleum industries with their advanced measurement techniques and air pollution control systems. Clearstone has received $1.6M in environmental grants from the Energy Innovation Program. Funding support will allow the company to research technologies and practices that measure, detect, and decrease volatile organic compounds (VOC) and methane emissions. They have also been working closely with China to help manage methane emissions in the oil and gas industry, which offers a great opportunity to share Canadian innovation and knowledge. Patro Research Ltd. is an energy research company conducting applied research and development activities for improved access to cleaner, more reliable, and affordable energy, predominately in developing countries. Within the oil and gas industry, they are seeking to improve energy production, conservations, and utilization systems in terms of efficiency, performance, scalability, and practicability. Patro Research Ltd. has received $600,000 in funding for cleantech projects. The company will use the environmental grants to research and secure opportunities for the most cost-effective, high-impact methane emissions reduction processes. They will also be developing methane mitigation options for the integrated oil and gas pathways through which natural gas is produced and delivered to end users. These innovative methods will be implemented in Canada as well as developing nations. The Energy Innovation Program (EIP) was a Canadian government funding program that supported energy technology innovation to produce and use energy more cleanly and efficiently, while strengthening the Canadian economy. Projects that were eligible for the program sought to produce/use energy in a cleaner and more efficient way than what was previously available. The Energy Innovation Program (EIP) provided up to 50-75% of project costs to a maximum of $5 million in clean technology grants. Projects supported had to align with strategic priority areas such as: carbon capture, use and storage, reducing greenhouse gas emissions in the building sector, addressing methane and volatile organic compounds, and improving industrial efficiency. The program ended March 31, 2018 and has not yet announced a new release date. 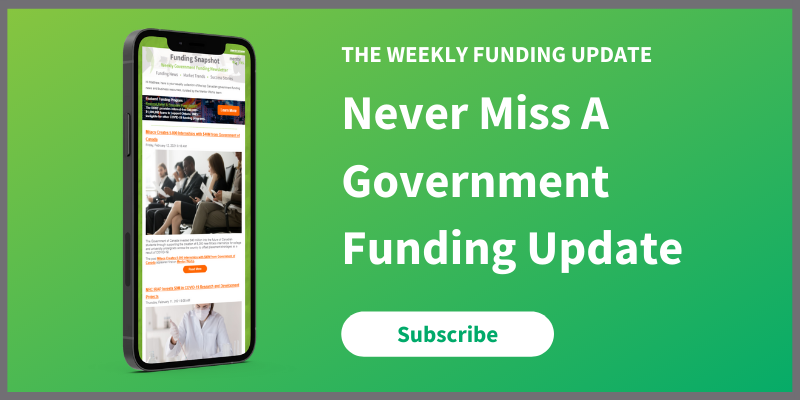 To stay up to date on business grants, industry and funding news, and resources geared to Canadian businesses, sign up for Mentor Works’ Weekly Funding Newsletter.